LFC Blog — Lancaster Flower Co.
I’m not a writer and I’ll never pretend to be. But I’d love to share what “knowledge” I have of the wedding world with you! I would love to start though, by explaining how I got to where I am today, cause it’s kinda gnarly story. Picture a young 18 year old Nadine, graduating high school in 2012, top of her class with honors clubs out the wahoo. A typical eager-learner type. Headed off for Liberty University in August 2012 to study (of all things) nursing! I love learning things! It is my favorite! But when we started talking about nursing practicals and all that was coming, I wasn’t completely stoked about it. No, I actually started to think “Nadine, where do you see yourself in 5 years?” and I answered “Well, I see myself at home with babies” This was when I first realized that maybe, all the noise about college…just wasn’t for me. I decided to come home from college. It was such a hard decision, Liberty is a great school. But God had different plans. So I came home and started my job working in the hardware store I worked in during High School. Everywhere I turned, people came at me wondering why I wasn’t in college. It was one of the first times in my life I had no idea what I was going to do and the fact that grown adults were coming at me like lions on a bigmac, telling me ill be a failure…it just wasn’t a recipe for happiness. Down the line a bit, my older sister came to me and said she has a friend who is getting married and doesn’t want to pay a florist. She suggested I do it since I’d always been artsy-fartsy. Of course I said yes, because art is amazing. Disclaimer::: I had never been to a wedding before! And the most I’d arranged is tiny home-garden arrangements. My sister and her friends started getting married and guess who got to do some weddings? Me! Experience is everything. I didn’t go to school for this, I didn’t work in a flower shop (believe me, I applied all over). I called myself Petals. (pretty sure every florist starts out with the name petals?!) It was January 2016 and I decided to make a facebook. Maybe get a wedding a month? I started the year with 3 weddings booked. By June I had over 50. Yeah// like five-zero. If I hadn’t been sure about whether I should do this or not, God made that seriously clear here. You ever pray for clarity about something? God knew my heart was yearning for purpose and a clear path. He showed that to me. The first year, I did about 30-35 weddings. I was blown away. I was a business and that was that! 2017 brought some new changes. I did about 50 weddings that year. I had contracted help when needed from spring-early fall, then was solo again for the busy season. I realized, the bigger I got, that there were too many florists in the area with a name resembling “Petals”. So a name change was in order! I asked my fam and friends for some ideas…couldn’t settle on one, until my sister said “How about Lancaster Flower Co. Dean!” It stuck. At first I was like…uhmmm I do weddings outside of Lancaster County!! My sister came back with “have you ever been to Appalachian Brewing Co? Cause you probably didn’t go to Appalachia for that.” With that, I confirmed my new name and here we are with Lancaster Flower Co.
2018 was a year of continual growth and learning. 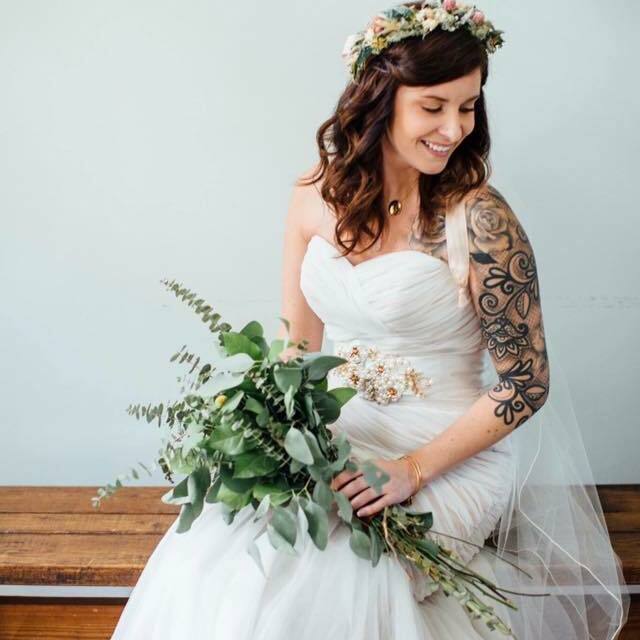 Going full-time in my business (just a little sidegig for peace of mind) Networking with other professionals, florists, photogs, venues, djs…the list goes on and on. Adding to my team & 65-70 weddings later and it’s 2019 with a January wedding already in the bag. Small roots. I come from small roots. And I share my story because 1: God is crazy faithful. 2: College isn’t for everyone, and no matter how many times people tell you that you’ll be a loser for not going to college –remember that’s a LIE straight from the mouth of satan. And 3: Doing what you love is a blessing in itself and will *hopefully* show in what you do. Lancaster Flower Co. is here to love on people. We care about our brides and grooms and clients because this is a small business. I do a happy dance when someone books us. If we can help show God’s beauty to our clients and others we reach, then we can say we put in a good days’ work. Lancaster Flower Co. has decided to put out a blog every once in a while! This blog will contain ideas, inspirations, real talk, touchy subjects, and more! Stop on over and check it out every once in a while! It’ll be fun!